Finished Feb 2018. Final score: 3 / 5. I got this book at a good discount, and it sounded interesting. None. I went in blind. This is a denser, darker, and more complicated Star Trek: TNG. This book is dense. Very dense. It has political maneuvering. It has fighting. It has death. It has foul language. It has royal families. It has interplanetary travels. And it is all woven in to a very complicated story. The book makes you appreciate the importance of trade routes. Much of our own history centers around towns becoming important by simply being in the center of trade crossroads. This book takes that theme and multiplies it by a million. I would classify this story as Star Trek: The Next Generation except written for adults (due to foul language, brutal situations, and adult situations). Think of TNG if it aired on HBO. You'll get a decent idea. It is a very complicated story. Lots of threads running, and the threads reference things that happened a while back. It starts to get difficult to follow all the names. I personally am willing to accept getting lost a few times when I read sci-fi/fantasy. I still would have appreciated dropping a thread. The book did close the bulk of the story arcs, but the story is certainly not over yet. The author left himself quite an opening. I went searching for the next book as I was deciding if I wanted to continue, and I was disappointed that as of early 2018, book 2 does not exist yet. Shame. This is why I usually resist unfinished series. I enjoyed the story. I am content enough to drop this on book 1. 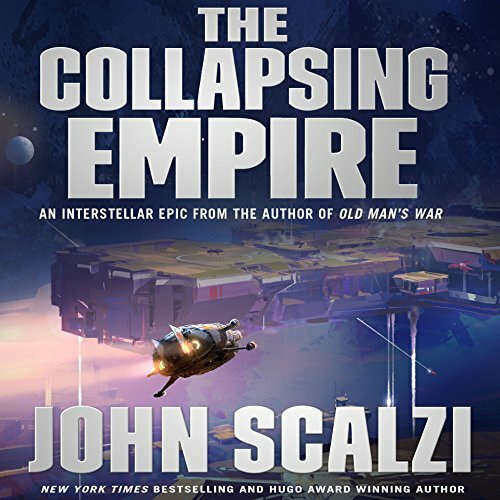 Discuss The Collapsing Empire (Book 1) in the forums.